A 56-year-old black man presents to the clinic for a routine physical examination. He has not seen a physician for 10 years. On arrival, he is noted to have a blood pressure of 160/90 mm Hg. A. Does this man have hypertension? Why or why not? B. What physical findings might be present if he has had long-standing hypertension? C. What are some of the important complications of hypertension? D. What are some causes of hypertension? A. 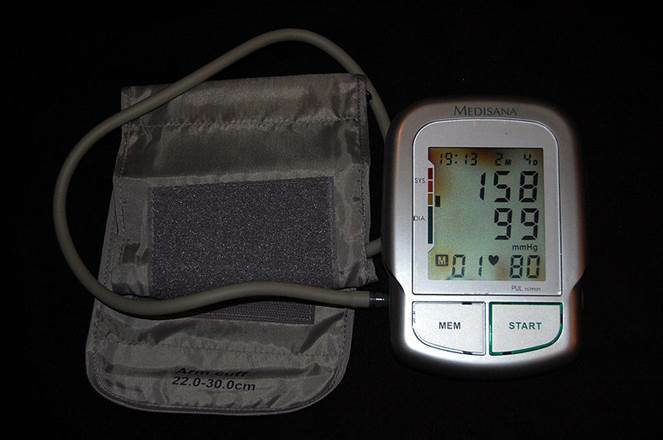 Hypertension is generally defined as a blood pressure greater than 140/90 mm Hg on two consecutive doctor’s office visits, and prehypertension as blood pressures of 120–139/80–89 mm Hg. Although this patient would certainly be considered to have high blood pressure on this visit, he would not yet be diagnosed with hypertension. B. In long-standing severe hypertension, one may note hypertensive retinopathy, including narrowed arterioles or even retinal hemorrhages and exudates. Cardiac enlargement resulting from hypertrophy may be noted as a displaced and prominent point of maximal impulse on cardiac palpation. An S4 may be heard on cardiac auscultation. C. Complications of hypertension include accelerated atherosclerosis resulting in ischemic heart disease, thrombotic strokes, cerebral hemorrhages, and renal failure. In severe hypertension, encephalopathy may occur. D. By far the most common cause of hypertension is essential hypertension, and that is probably the cause in this patient. Because the patient is black, salt sensitivity may be a contributory factor. Other relatively common causes are diffuse renal disease, medications, renal arterial disease, and neurologic disorders. Less commonly, coarctation of the aorta, mineralocorticoid excess, glucocorticoid excess, and catecholamine excess can cause hypertension. IVMS |BMS Hem.-Onc. Study and Review, USMLE Step 1 Prep.